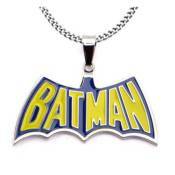 Batman Blue-and-Yellow Batman Pendant with Chain:Wear your love forBatman!Blue-and-yellow pendant includes a 24-inch chain.Beautifully crafted of stainless steel.Show your love for the Caped Crusader by wearing this Batman Blue-and-Yellow Batman Pendant with Chain wherever you go. Beautifully crafted of stainless steel, the colourful pendant measures approximately 1 5/8-inches wide x 1 3/8-inches tall and comes with a 24-inch chain. Ages 13 and up!